The department has over 300 PCs and more than 60 iMac computers integrated in a gigabit Network, in addition to numerous "Services" and "Application" servers. The computers are dual boot Windows7/Course specific OS or Windows10/OS X, with general Microsoft tools provided by the current Campus agreement and other special applications (Adobe Multimedia tools, Matlab, IBM Rational Software, Oracle, etc.) to satisfy a wide range of teaching mission. The software is updated every term and the systems are monitored closely. The equipment and computers are upgraded regularly within 3-5 years. Hardware: There are numerous brand-named servers and workstations, and over 300 high-speed personal computers and 60+ iMac all-in-one computers (with CPU from 3.3 GHz Quad-core Intel Core i7 Turbo Boost up to 3.8GHz, 16GB LPDDR3 RAM, 512GB Flash storage and 21.5-inch Retina 4K display). All of which are connected to the high speed 1Gbit Network. 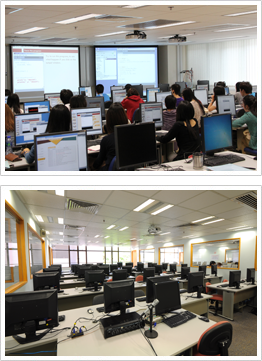 In addition, students can access a numerous high-speed number-crunching machines, and a PC Cluster consists of 50 nodes. Department also provides various multimedia accessories and embedded system devices for students’ project development. Server applications: Sun Solaris, Linux servers, Windows servers, and Oracle Server Enterprise Edition etc. Development applications: Oracle Internet Developer Suite (iDS) and Oracle Internet Application Suite (iAS), Rational Rose, RSA/RDA, Linux, Matlab, Microsoft MSDN Academic Alliance (MSDN AA) program - the easiest way to get the latest Microsoft software for students in the technology and design fields, and etc. Multimedia applications: Up-to-date multimedia development tools and applications, such as Adobe Creative Suites and Studio, Premiere, and etc.